Jim Eaton and Bill having the first sampling of their self-proclaimed Bear Spit. Click photo to enlarge. When asked to describe Bear Spit they said that it has a “full body, good color, is sediment free, and has good carbonation.” They also said that Bear Spit has double the amount, if not more, of alcohol content than Wild Willy’s Wheat. The first sampling of Wild Willy's Wheat. Click photo to enlarge. The kit for Wild Willy’s Wheat included only one ounce of hop pellets. Bill and Jim felt that because they first sampled Bear Spit, the hoppy flavor of Bear Spit was still overpowering their taste buds when they secondly sampled Wild Willy’s Wheat. Therefore, when they sampled Wild Willy’s Wheat, it seemed mellow in comparison to Bear Spit. Had they only sampled the wheat beer (i.e., with no lingering Bear Spit hoppiness on their taste buds) they would have thought Wild Willy’s Wheat had a full-bodied taste. 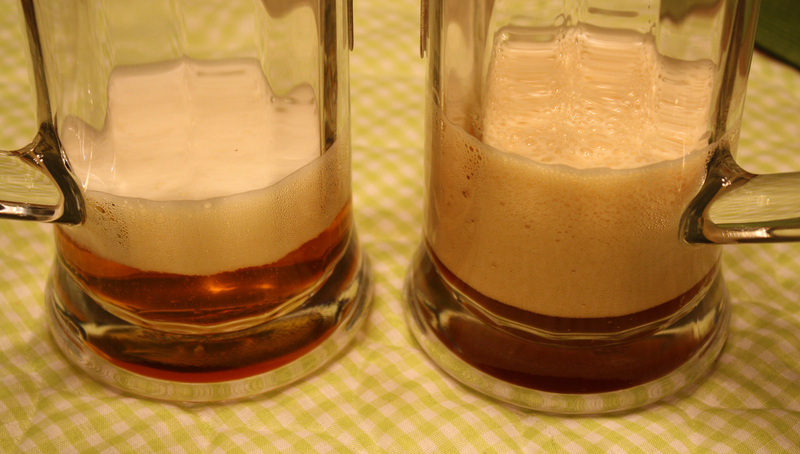 L to R: Wild Willy's Wheat and Bear Spit. If you click to enlarge, and then enlarge even a second time, you can see the carbonation bubbles in the Wild Willy's Wheat. This photo color isn't great, but you can get the idea that Bear Spit is darker than Wild Willy's Wheat. 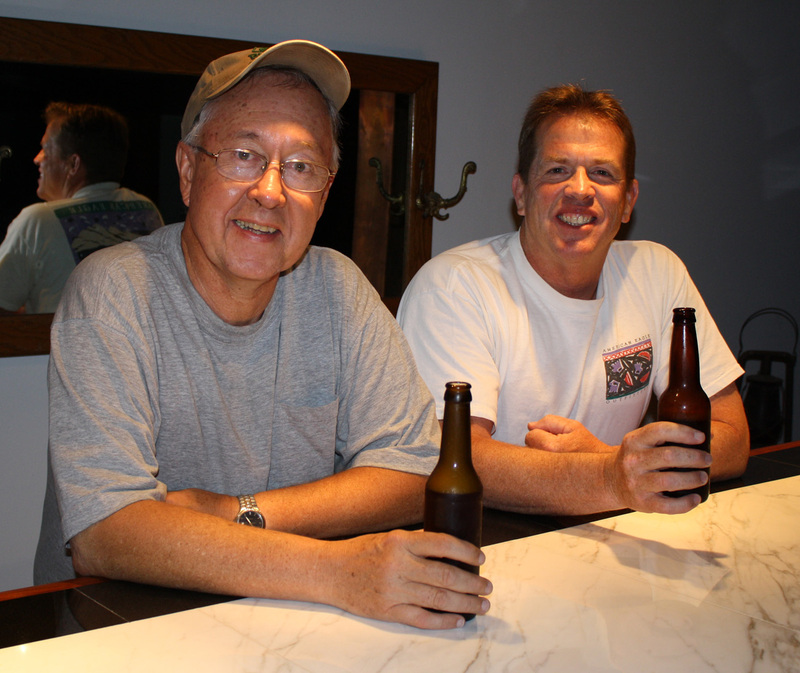 Jim and Bill both gravitate to dark beers. They think Bear Spit and Wild Willy’s Wheat each has a great taste. Since they like hoppier beers, they were especially impressed with Bear Spit. I’m a wheat beer lover. One sip of Bear Spit was enough for me to “appreciate” it. We joked that anyone drinking it could grow hair on his/her chest. Seriously, though, I had fun sampling it. But, I was glad to gravitate to the beer more to my liking, the Wild Willy’s Wheat. 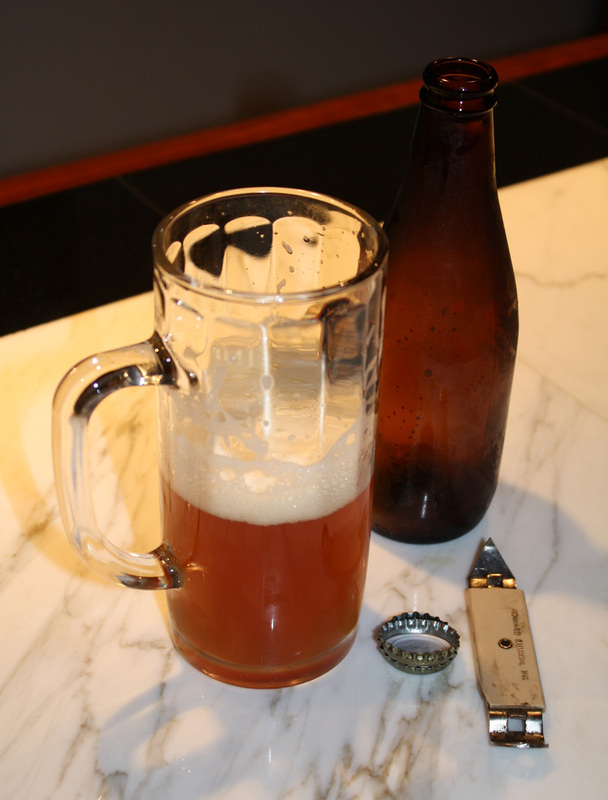 This entry was posted on July 15, 2009 at 12:03 am and is filed under Beer Making. You can follow any responses to this entry through the RSS 2.0 feed. You can skip to the end and leave a response. Pinging is currently not allowed. Haha: “Hoppy makes you very happy.” Good one! So . . . what the pun of “quite the bite” (think bears) intended? And . . . where was Mr. W. all this taste-testing time? Hey, Amy, your dad is quite the brew meister! I’m glad you like his creations. It is so much fun to be around when they put their meister skills to work! Peggy, the location of the first photo is in the other part of the basement. Hey, I hadn’t even thought of the bite-bear pun. But, kind of fun now that you mention it! Hmmm…..Mr. W? Do you mean Wild Willy? Wasn’t Dave W. in one of your pictures? So . . . they brew in the basement and not the kitchen? They heat up the mixture in the garage. It cools more in the kitchen, and they add yeast and I don’t know what else in the kitchen. It stays in the carboy in the basement covered up with a blanket. Then it gets bottled in the basement. The bottled beer “sleeps” covered with a blanket until two? or three weeks later or longer when it is ready to drink. So, the full process takes place in our garage, kitchen and basement.